Today, customer identity is the only constant in digital marketing. But as consumers switch from desktop to mobile, they are more and more difficult to recognize. But it’s not impossible. 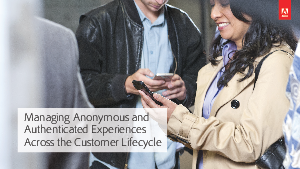 The Adobe white paper, Managing Anonymous and Authenticated Experiences Across the Customer Lifecycle, explains best practices to identify your anonymous and authenticated customers while complying with regulations, contracts, and industry standards.